Dry Deck Shelters (DDSs) provide specially configured nuclear powered submarines with a greater capability of deploying Special Operations Forces (SOF). DDSs can transport, deploy, and recover SOF teams from Combat Rubber Raiding Crafts (CRRCs) or SEAL Delivery Vehicles (SDVs), all while remaining submerged. In an era of littoral warfare, this capability substantially enhances the combat flexibility of both the submarine and SOF commandos. Dry Deck Shelter (DDS)-01S sits atop USS Dallas (SSN 700) in June 1998, following the first fit-up of a DDS to a Los Angeles (SSN 688) Class submarine. Ever since Jules Verne�s fictional Nautilus and Simon Lake�s early submarines, the deployment of divers from submerged submarines has captured imaginations. Frogmen in World War II conducted clandestine operations from the diesel-electric submarines of the period. Divers have long envisioned submarines specially equipped for their unique needs, including the use of a more spacious lock-out/lock-in chamber. 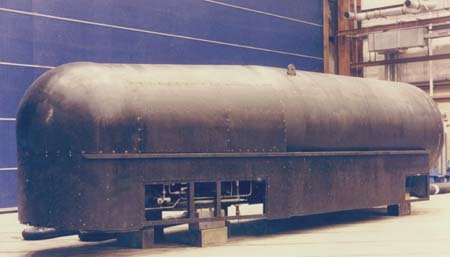 USS Grayback (SS 574) contained two such chambers and used this capability from 1969 to 1983. On January 16, 1982, five Navy divers died in the starboard chamber when a vacuum was rapidly drawn. Following the investigation, substantial upgrading of design, procedures, and training took place in Deep Submergence Systems. The concept of a detachable Dry Deck Shelter with the ability to house, deploy, and retrieve SDVs, was born in the late 1970s. The Electric Boat Division of General Dynamics Corporation completed DDS-01S in 1982. [Note: The number indicates its order of construction, and the S indicates that its outer hangar door opens to the starboard side.] Newport News Shipbuilding completed the construction of DDS-02P, -03P, -04S, -05S, and -06P between 1987 and 1991. The following submarines once accommodated DDSs but have since been decommissioned: USS John Marshall (SSN 611), USS Sam Houston (SSN 609), USS Silversides (SSN 679), USS Archerfish (SSN 678), USS Cavalla (SSN 684), and USS Tunny (SSN 682). Submarines currently configured for DDS use are USS William H Bates (SSN 680), USS L Mendel Rivers (SSN 686), USS Kamehameha (SSN 642), USS James K Polk (SSN 645), and USS Dallas (SSN 700). Ugly but functional, a Dry Deck Shelter rests on blocks at one of two shore-based training facilities. Some fairing panels have been removed to allow access to mounting bolts. 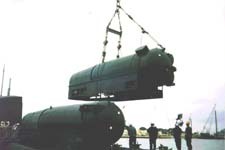 The portable DDS is designed for temporary installation on modified host submarines. 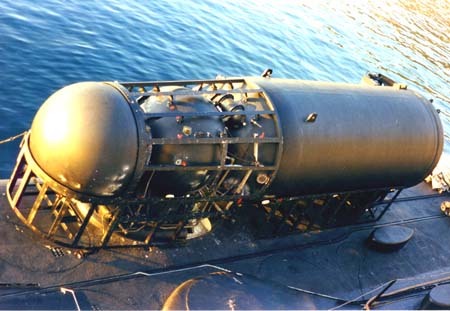 To date, DDSs have been operated from four former ballastic missile (i.e., Benjamin Franklin Class) submarines and six submarines of the Sturgeon (SSN 637) Class. Installations on additional Los Angeles (SSN 688) and Seawolf (SSN 21) Class submarines, as well as Virginia Class attack submarines, are planned in the future. Overall, the DDS is 9 feet wide, 9 feet high, 38 feet long, and displaces 30 tons. It consists of three interconnected compartments made of HY-80 steel within a fiberglass fairing, each capable of independent pressurization to a depth of at least 130 feet. The forward-most compartment, a sphere, is the hyperbaric chamber which is used for treatment of injured divers. In the middle compartment, or transfer trunk, operators enter and exit the submarine and/or either of the other compartments. The third compartment, the hangar, is a cylinder with elliptical ends which houses either the SDV or up to 20 SOF personnel with CRRCs. The DDS may be transported to its host ship by barge, trucked over land, or flown via C5A aircraft. Each DDS has a specially designed truck called a transporter for this purpose. Complete on-loading and testing to make the DDS ready for manned operations at-sea takes from 1-3 days. Two shelters can be installed aboard Benjamin Franklin Class submarines; other submarine classes are single-shelter ships. Modifications to a submarine allow it to serve as a DDS host ship. These include mating hatch modifications; addition of electrical penetrations, valves, and piping for ventilation; divers� air; and draining water. A routine onload of Dry Deck Shelter (DDS)-04S aboard USS Kamehameha (SSN 642), one of two dual-shelter host ships. The two major mission areas for the DDS are SDV launch and recovery, and Mass Swimmer Lock-Out (MSLO). For SDV missions, Mark 8 Mod 0 or Mod 1 SDVs are generally used, although the DDS can also accommodate the Mark 9 SDV. The miniature wet submersible sits on a cradle within the DDS hangar until ready for use. After flooding the hangar and equalizing it with outside pressure, the DDS operators open the hangar�s large outer door and wheel out a track onto the topside surface of the submarine. The cradle and SDV roll out on the track, and the SDV departs. DDS operators then return to the submarine or may remain outside. After conducting their mission, SDV operators locate the submarine by means of an active pinging sonar. When the SDV returns, divers secure it to its cradle, winch it back into the DDS, and shut the hangar outer door. MSLO operations may be performed with the submarine surfaced, submerged, or awash. Generally, the SOF team uses CRRCs, large rubber rafts with outboard motors. The rafts are stored rolled up within the hangar until ready for use, and then are inflated on deck. Though less clandestine than SDVs, CRRCs can insert more commandos into an area more quickly, an advantage for some missions against particular threats. DDSs are operated and maintained by members of SDV Team One in Pearl Harbor, Hawaii, and SDV Team Two in Little Creek, Virginia. The SDV Teams report to Navy Special Warfare Groups One and Two, which report to Naval Special Warfare Command in Coronado, California. U.S. Special Operations Command, a joint command in Tampa, Florida, oversees all of these organizations. Memoranda of Agreement (MOAs) provide the proper interface between the SOF community and the submarine crews, squadrons, and submarine Type Commanders. Special Operations Forces may train aboard a DDS at one of two specially outfitted training facilities at the SDV Team locations. Each training facility has the capacity for conducting wet, pressurized training of DDS operators. With all fiberglass fairings removed, this Dry Deck Shelter reveals its three internal compartments. Normally SDV Teams perform preventative maintenance with standard maintenance requirement cards. However, when an MOA is in effect, the submarine crew performs some of the Planned Maintenance Schedule (PMS) requirements. Restricted availabilities are conducted every 18-26 months, usually at the depot level but occasionally by the SDV Teams themselves. Regular overhauls occur every ten years at the depot level. These are complete overhauls during which the depot removes, refurbishes, and reinstalls all components. Planning Yard services are provided by Newport News Shipbuilding under the oversight of the Supervisor of Shipbuilding, Conversion, and Repair (SUPSHIP) in Newport News, Virginia. Several other organizations including the Submarine Maintenance Engineering Planning and Procurement Agency (SUBMEPP); Portsmouth Naval Shipyard; the Naval Experimental Dive Unit (NEDU); the Naval Surface Warfare Center (NSWC), Annapolis; the Fleet Technical Support Center (FTSC), Pacific; and Electric Boat Corporation provide support to the program. Four Los Angeles (SSN 688) Class submarines, in addition to USS Dallas (SSN 700), are slated for conversion to be DDS host ships. To date, modifications are nearly complete on USS Los Angeles (SSN 688) and USS Buffalo (SSN 715). Conversion of USS Philadelphia (SSN 690) has begun, and work on USS La Jolla (SSN 701) will commence in Fiscal Year 2000. Following these conversions, USS Jimmy Carter (SSN 23) will undergo similar modification. Several hulls of the Virginia Class Attack Submarine will serve as DDS hosts as well. All Virginia Class submarines will also contain an integral Lock-Out Trunk capable of deploying nine divers and their equipment. It is possible that some of the early USS Ohio (SSBN 726) Class submarines may also become host platforms. With an expected service life of at least 40 years, Dry Deck Shelters will likely continue to support the missions of Seal Delivery Vehicle deployment and Mass Swimmer Lock-Out, serving both the Special Operations Forces and submarine warfare specialties for many years to come. Tom Lewis, NAVSEA PMS395A2; DSN: 332-6701; commercial: 703-602-6701; fax: 703-602-6653; e-mail: [email protected] . Steve Southard, NAVSEA PMS395A22; DSN: 332-6701; commercial: 703-602-6701 x222; fax: 703-602-6653; e-mail: [email protected] . Steve Southard is the Dry Deck Shelter Project Officer in the Support Submarines/Special Warfare Branch of the Deep Submergence Program Office within NAVSEA�s Submarine Directorate.